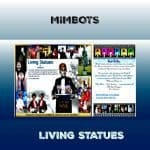 Mimbots mime artiste and living statue Michael has been entertaining crowds for over 20 years in more than 10 countries. He is based in Brighton. Miming isn’t good when you’re singing but when you’re one of the in-crowd anything goes. This foppish twit of all twits has been entertaining thousands full time for the past 18 years with his buffoonery and Mimbots silent art. His subtle wit and charm knows no boundaries. He invites everyone into his silent, invisible world and has over 2000 credits for British and international television. A mime or mime artist (from Greek μῖμος, mimos, “imitator, actor”) is a person who uses mime as a theatrical medium or as a performance art, involving miming, or the acting out a story through body motions, without use of speech. In earlier times, in English, such a performer would typically be referred to as a mummer. Miming is to be distinguished from silent comedy, in which the artist is a seamless character in a film or sketch.